1. It is a flexible, easy-to-make recipe. 2. The recipe will be easy to read with straightforward instructions and simple measurements. 3. It will still taste good if a couple of mistakes have been made (I’m pretty sure these are foolproof). 4. It can actually be made independently by your kids (except for the fire parts). 5. Your kitchen is probably going to be a mess afterward. 6. But your kids will be practicing reading and cooking at the same time! 7. This is the first step to you lying on the couch playing Word Chums while your kids make dinner on Fridays. Our 5 year old was a budding but somewhat reluctant reader last year – she could read things along the lines of Little Bear and Frog and Toad but as soon as she got to a word she didn’t know right away, she wanted to “take a break.” After several weeks of frustration I told Margaret, my big helper in the kitchen, that she could cook dinner alone once she was old enough to read the recipes. She was immediately enthused by this prospect and RACK recipes were born. 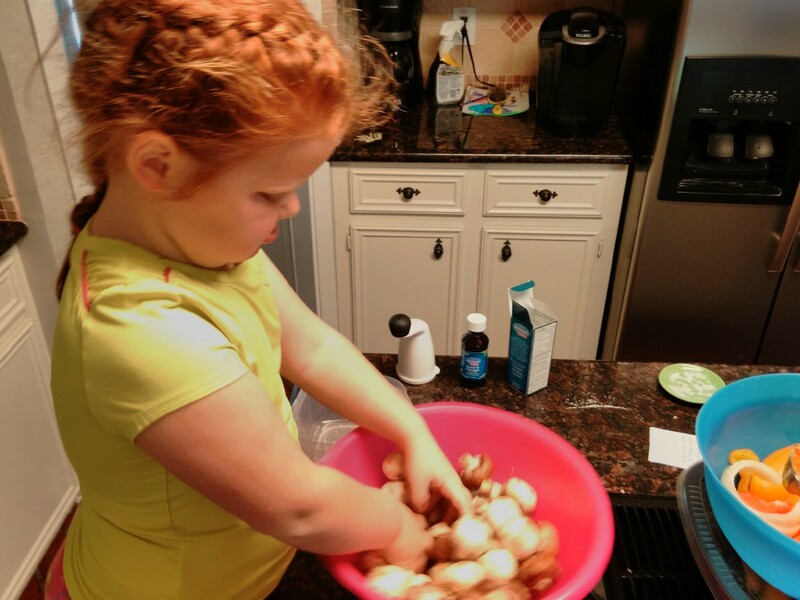 Though she has since become an independent reader and cook, we started out slowly. I used to put all of the ingredients, mixing and measuring implements, and cookware on the kitchen counters where she could find them, then would hand her the instructions I had written on a sheet of printer paper, go into the next room and close my eyes. I’m one of those “clean as you cook” types, so this was really a lesson for me as well. Margaret has become quite skilled at preparing everything from gourmet pizzas to roast pork tenderloin but I started out with recipes that all but guaranteed her success. Below is what we call “Pinch and Pour Marinade,” meaning “2 pinches of ____” and “1 pour of ______,” in terms of measurements. Approved by Step Into Reading or Scholastic? I like to think they’d appreciate my initiative. Professional chef material? Perhaps not. Tasty with basically any roasted or grilled vegetable you could imagine? You bet. In this case, we were grilling onions, peppers, mushrooms, and zucchini so I set out the veggies, several small and large mixing bowls, a few stirring tools, a butter knife and the marinade ingredients – kosher salt, a loaded pepper mill, a jar of minced garlic, olive oil, white vinegar (apple cider works here too) and sugar. Margaret cut up veggies with the butter knife and stuck them in various bowls. As you can see from the pictures, size doesn’t matter. Speaking from the perspective of a kitchen control freak, what is really going to happen if the peppers are not even steven? That was not the knife Margaret used, she’s just monitoring salt pinches. Margaret followed the recipe for the marinade while I gathered laundry and embarrassed her by taking pictures. She stopped twice to ask about words and once so Adam could add the pinches of salt (his favorite part every time). Since our chefs are 4 and 5, we’re not yet to the point of unsupervised fires yet, so in our house this means calling mom to turn on the grill. Here are the actual instructions I handed to our young chef. For some reason, Margaret always likes to have ten or more instructions, and thinks recipes with less than this are “for babies.” I guess she wouldn’t appreciate my “5 Steps or Less Crockpot Cooking” book yet. 1. 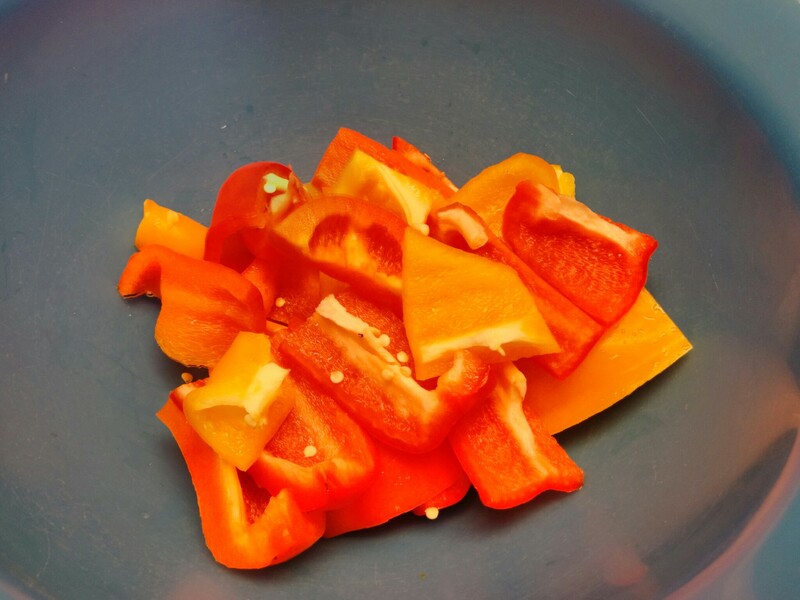 Cut up peppers, onion, and zucchini. Put them in a big bowl. 2. Put mushrooms in a big bowl. 3. Put 4 pours of oil into a little bowl. 4. 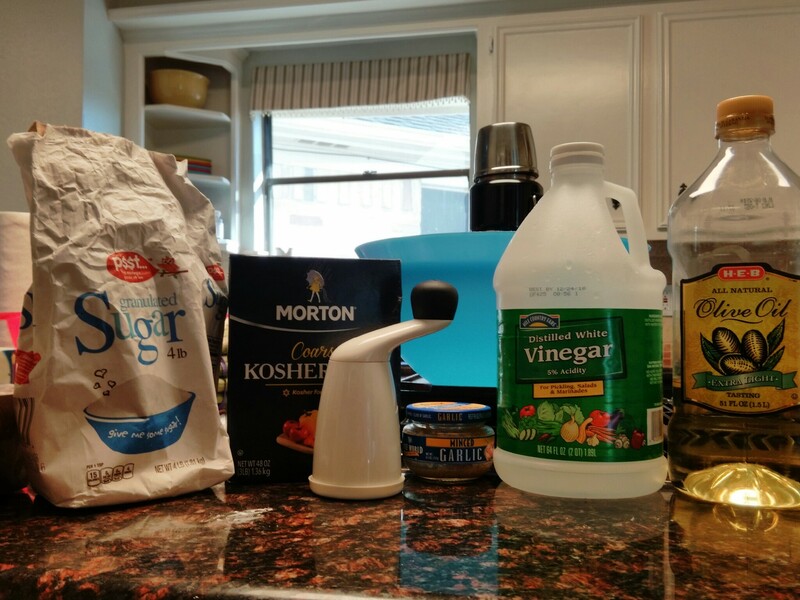 Put 2 pours of vinegar into the bowl. 5. Add 2 big spoons of garlic. 6. Then add 3 pinches of salt. 7. Next, put 5 pinches of sugar. 8. Add 6 turns of pepper. 9. Stir it all up and pour it into the big bowls. 10. Mix it all up and get mom, you did it! I often tweak the amounts of pinches and pours in this recipe depending on what food is being marinated and who is doing the cooking. Adam loves to pinch the seasonings and his fingers are very tiny so I up the number of pinches on everything except for salt – even with those tiny fingers he always salts the heck out of everything. 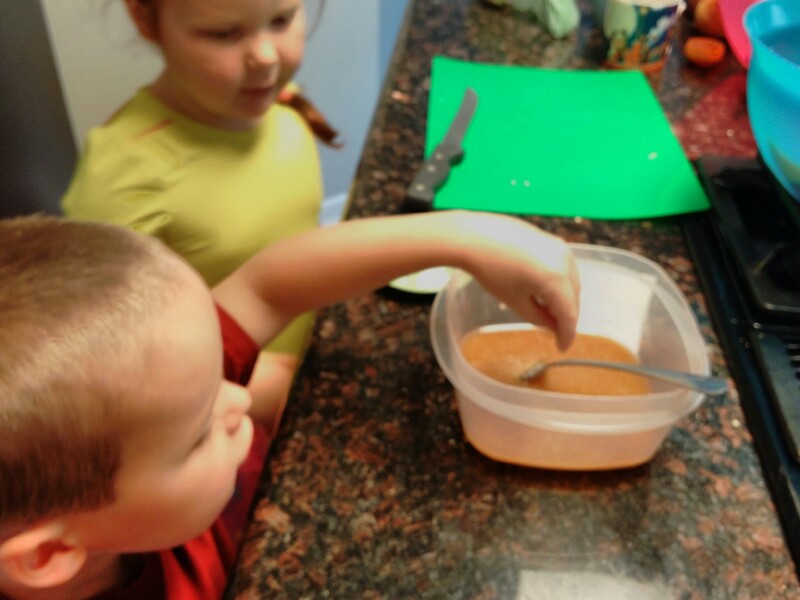 Margaret, on the other hand, is very conservative with her pours – sometimes her “pour” is my “glorified drip,” so I often add more pours of oil or vinegar than I would for the other kids. If you try out our marinade I’d love to hear about your experience! Keep an eye out for more RACK recipes, as well as the easy and delicious dairy, nut and soy-free smores bars we made this evening. From my new site thecentralparkzoo.com!